Post #118 - Every bird has a story; Leg bands help tell it! Brown Pelican to set the stage! In transiting in and out of Pillar Point Harbor on my many recent pelagic trips, I've trying to find and photograph as many banded Brown Pelicans as possible. It's a fun little game, and I usually find between 4 and 6 birds on our slow exit from the harbor as we head out to sea. Alvaro Jaramillo put me in contact with some folks at International Bird Rescue, and I've since been submitting my sightings through the appropriate channels. It turns out that I've photographed pelicans that have been banded by a number of different agencies under a bunch of different circumstances. I am going to share this banding information with you so that you two can report a banded pelicans if you are lucky enough to find one. photographed in Pillar Point Harbor on Sept 14, 2017. Case histories of some of these are below. BLUE BANDS: International Bird Rescue places blue bands with with white letters on Brown Pelicans that have been rehabilitated and released from either their San Francisco or Los Angeles centers. The H and M series are several years old; The N series is more current. 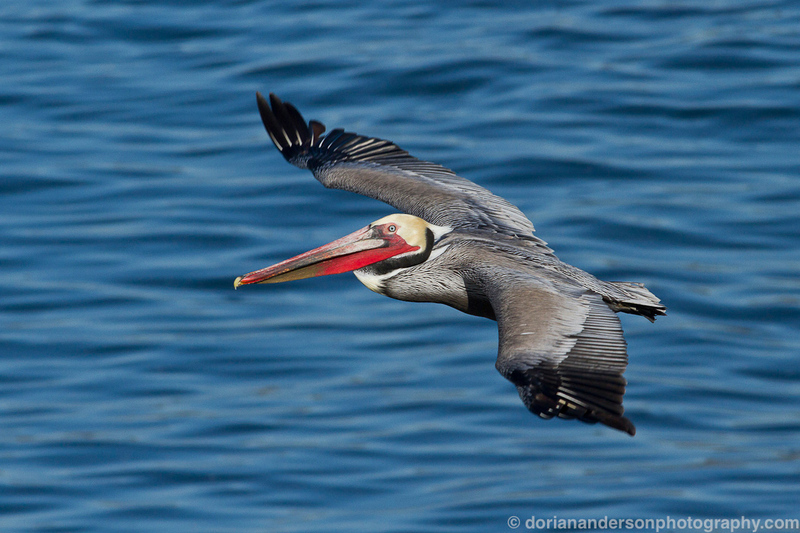 To report a blue banded pelican, click here. For some more general information on the project, please look here. GREEN Z BANDS: These bands (also with white lettering) are used by Oiled Wildlife Care Network, and 46 of them were placed individual Brown Pelicans that were oiled (as a result of a crude oil pipeline leak) near Refugio State Beach in Santa Barbara in the spring of 2015. 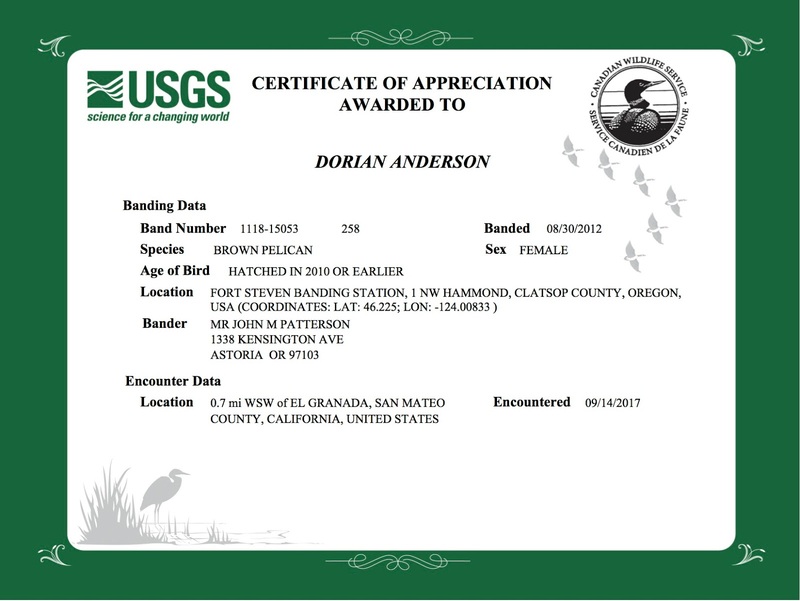 To report a green banded pelican, click here. WHITE BANDS: White bands with black lettering are used by The Wildlife Center of the North Coast (WCNC) rehabilitation facility in Astoria, Oregon. 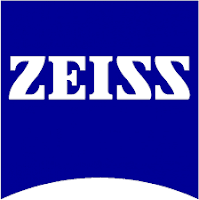 In collaboration with the Pacific Eco Log (PEL) and the United States Geological Survey (USGS). In 2009, those agencies jointly initiated a banding project to band pelicans on the Oregon Coast. To report a white banded pelican, click here. RED BANDS: These bands were placed on chicks that hatched in Mexico in the last few years. I am still gathering all relevant information to report these to the appropriate agency, so please check back if you find one of these! H24: Juvenile, male Brown Pelican. Rescued on 06/04/2011 from Half Moon Bay, CA. Stabilized at Peninsula Humane Society (San Mateo, CA) until transfer to International Bird Rescue's SF Bay Center in Fairfield, CA on 06/05/2011 to continue care. Treated for anemia, emaciation, scabs on the bill and cactus thorns embedded in the feet. Released on 06/24/2011 at Alameda, CA. Sightings: 09/28/2013 at Half Moon Bay, CA; 10/02/2013 at Elkhorn Slough, CA; 07/24/2017, 9/14/2017 (photo indicates missing metal band) at Pillar Point, CA. M43: Adult, male Brown Pelican. Rescued on 02/18/2012 from Santa Cruz, CA. Stabilized at Native Animal Rescue of Santa Cruz until transfer to International Bird Rescue's SF Bay Center in Fairfield, CA on 02/21/2012 to continue care. Treated for a chest wound consistent with a bite from a California Sea Lion and a toe injury. Released on 03/03/2012 at Santa Cruz, CA. Sightings: 04/20/2012 (Unspecified location); 06/13/2013, 01/01/2015, 01/01/2015 at Santa Cruz, CA; 09/10/2015 at Pillar Point, CA; 12/20/2015, 01/15/2016 at Santa Cruz, CA; 05/08/2016, 07/05/2016, 07/27/2016, 07/28/2016, 08/01/2016 at Pillar Point, CA; 08/06/201 at Half Moon Bay, CA; 08/20/2016 at Pillar Point, CA; 11/13/2016 at Elkhorn Slough; 9/14/2017 at Pillar Point, CA. N66: Adult, female Brown Pelican. Rescued on 5/20/2017 from Redondo Beach, CA by animal control and immediately transported to International Bird Rescue's LA Wildlife Center on 5/20/2017 to continue care. Treated for emaciation, leg abrasions, anemia and hypothermia. Released on 7/7/2017 at White Point Beach in San Pedro, CA. Sightings: 8/22/2017, 9/14/2017 at Pillar Point, CA. As for the white-banded bird, I was super stoked and felt like a total badass when I received this certificate for my report. I know you have no life when this is the most exciting thing that happened to me this week. So, there it is. We now know a least a bird more about a few of the banded pelicans. Beyond knowing, it's a good feeling to contribute to these ongoing research projects. Data in such studies can be very difficult to obtain, so I am sure that any and all reports are greatly appreciated by the respective researchers and agencies. Also, as leg bands will in the future almost certainly be replaced by more advanced electronic tagging methods, it's fun to try to find bands before they become an obsolete tracking method. That's it for now. Now get out there a find a few banded birds of your own! 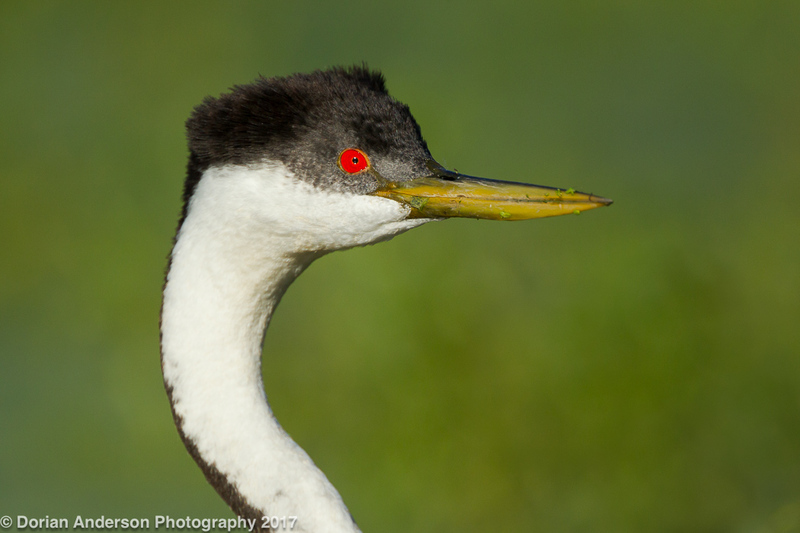 For those that didn't read last week's post, I described what seemed to me a colony-wide nesting failure of a large population of Clark's and Western Grebe on a freshwater lake/marsh here in California. Hundreds of birds collectively laid thousands of eggs, but only a few chicks seemed to have hatched. I used this blog to source some hypotheses as to what might have caused such a large scale nesting failure, and I received a few interesting responses. The first suggestion, as provided by both a blog reader and someone with weekly if not daily access to the colony in question, was that otters were in large part to blame. I didn't know this, but apparently otters are voracious predators, eating all sorts of stuff beyond what I assumed do be a fish-only diet. This idea seems plausible but I do not think is the entire story. I say that for two reasons. First, I spent several days kayaking through the colony and did not see a single otter. There would have to be dozens of them to devour all the hypothetical chicks. 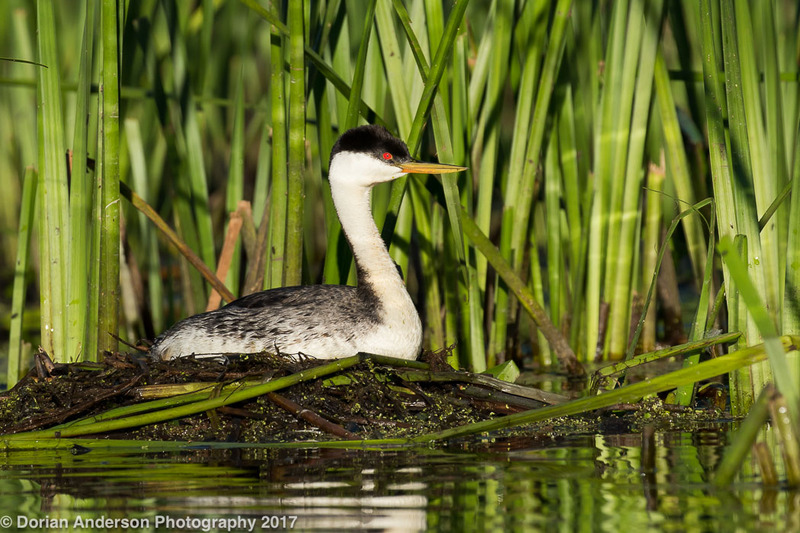 Second, many of the eggs hadn't hatched, even well-beyond the 24-day incubation period of Clark's and Western Grebes. Predation of any sort would explain a disappearance of chicks but not the apparent corruption of otherwise intact eggs upstream of that point. So, otters are a best a partial explanation. Other ideas that postulated were water levels or pollution/toxicity though nothing terribly specific beyond that was suggested. Either of these could have widespread effects and affect the nesting success of the entire population. That seems consistent with the colony-wide problems that I observed. Intrusion by boaters was also suggested though my inflatable kayak was the only boat that I saw near the colony on my 3 independent visits. So, unless I was single-handedly responsible for the death of thousands of eggs and chicks, I don't think boating disturbance was the primary (or even a significant) cause. But others might know better on that front. So, it seems as it the mystery will continue. Interestingly, a colony of Grebes in Clearlake, California experienced similar problems in 2014; From 3,500 nests, only ~20 chicks fledged that year. So, whatever is happening, it seems to be a big deal. We as a community need to keep our eyes on disturbing trends such as these. More pelagic trips coming up for me, so maybe I'll run into you aboard either Alvaro's Adventures or Monterey Seabirds! Post #116 - Info sought on grebe nesting failure! 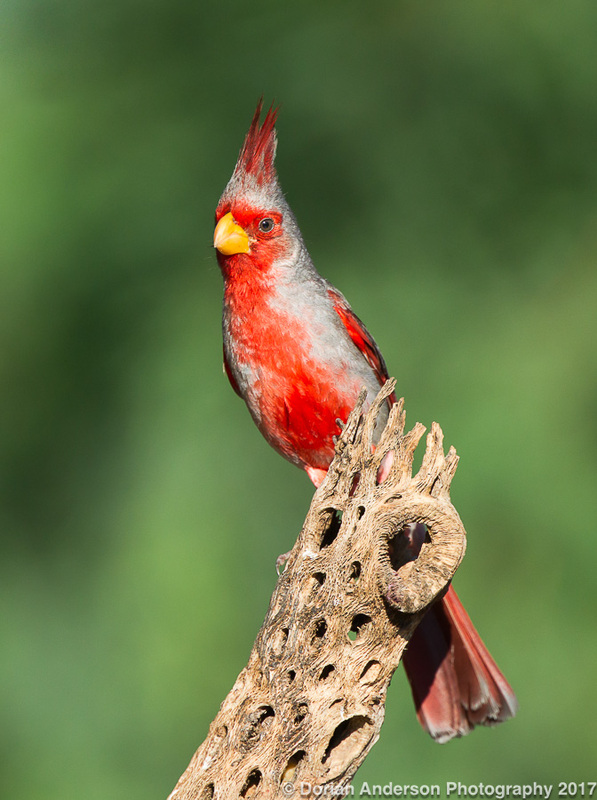 This is a different sort of post as I am really looking for reader input on a bird health/conservation issue that I have recently found curious and disturbing. 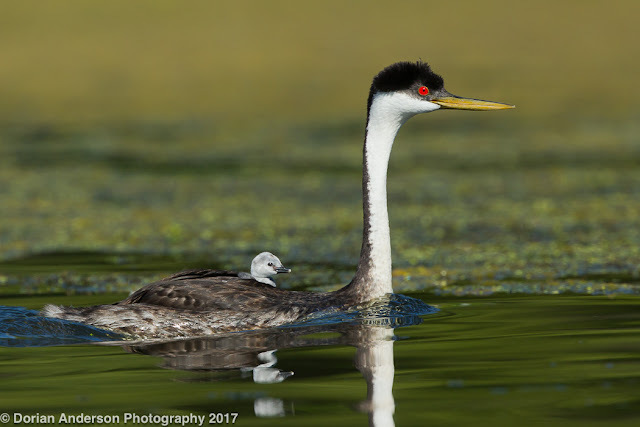 I am going to speak very generally about large a nesting population of Clark's and Western Grebes somewhere in Northern California. I am doing it this way since I don't want to outright publicize the location, but I am certain that many of you will know the spot to which I am referring. If you do, please just keep it under your hat, thanks. So, with that caveat out of the way, I want to field opinions as to what seems to be a complete nesting failure of a population of several hundred if not several thousand grebes. Grebes EVERYWHERE, but no chicks to be found anywhere?!?!? I first visited this particular location on July 5th of this year, and I was completely blown away by the number of birds I observed. I saw only 1 chick on that visit, but countless other birds were sitting on eggs at that time. I figured I had arrived just on the front end of what was surely going to be an huge hatch-out of grebe chicks in coming weeks. 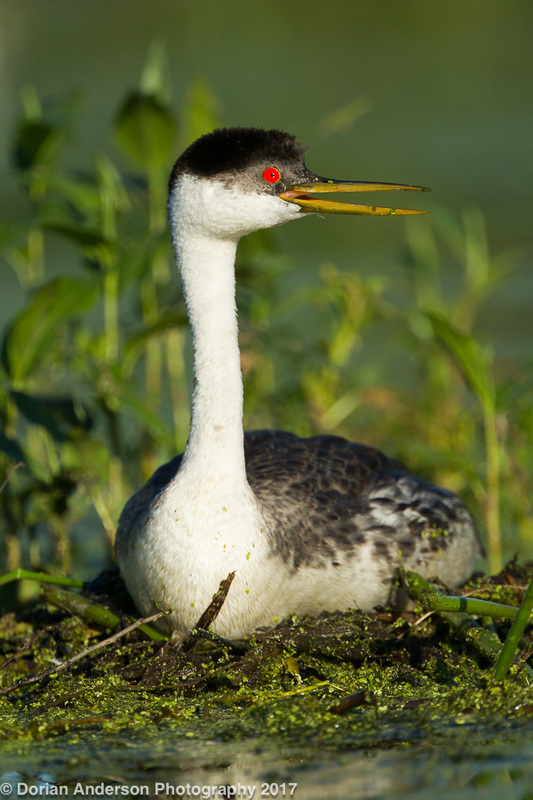 Consulting the Cornell Lab page on Western Grebe, it stated that the incubation period for the species is 24 days. I figured that if I returned in a few weeks, more of the eggs would have hatched by then. You can understand my surprise when I returned on July 24th - 19 days later - and found zero recently hatched chicks. If all of the eggs that I observed on the July 5th were just-then laid, sure, it would make sense that none of them had reached the required 24 days of incubation to hatch. But that seems really unlikely, particular once you read on. Fast forward to my third visit, on August 13. I thought for sure there would be all sorts of chicks by then, but, again, I found loads of birds sitting on eggs and no chicks (well, one, photo below). At that point I realized that something had to be very seriously wrong as the entire population hatched effectively zero young from what were certainly thousands of individual eggs from hundreds of individual pairs. To complete the timeline, a friend of mine visited the area this past weekend, on September 9, and said that all the nests had been totally abandoned. What the heck is going on?!?!!?? What was really strange is that the adults looked generally healthy to my eye. Notably, I did not see a single adult bird catch or consume a fish in any of my three visits. That lead me to wonder if a food shortage could have affected the nesting success of the entire population (though that would more likely affect chicks than unhatched eggs)? I also wondered if the unusually heavy rains that Northern California experienced this winter might have contributed. Perhaps increased runoff deposited more of a certain toxin in the water? Altered the sediment composition? Changed the osmolarity, etc? I really have no idea what cold explain the apparent nesting failure, so I'm really grasping for any possible explanation. Post #115 - Arizona birding! Plus Desert Photography at Elephant Head Pond! What the heck happened to summer?!?!? It seems as though we've jumped right into fall! 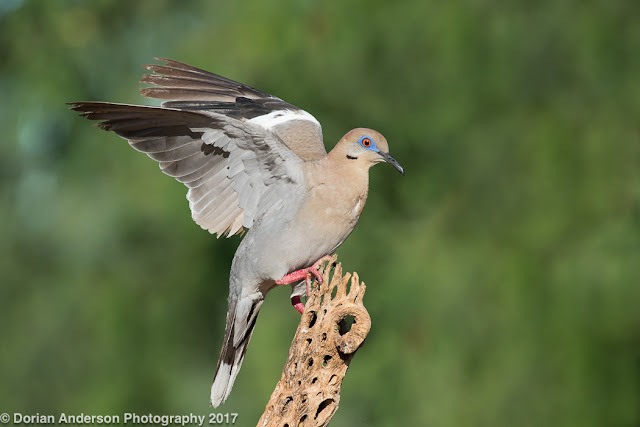 With that in mind, I want to quickly rewind to the first week of August, a week that I spent birding and photographing in Southeastern Arizona. Beyond what is fast becoming an annual pilgrimage to that birding Mecca (see Post #72 and Post #73 from last year), this year's trip was additionally motivated by 3 long-staying rarities that I wanted to add to my ABA list: Common Crane in Mormon Lake, Rose-throated Becard on the Santa Cruz in Tumacacori, and Tufted Flycatcher in the Huachucas. I found all three of those birds plus Five-striped Sparrow in California Gulch, so it was a great trip on the birding front, one that pushed my ABA list to 721! Both the crane and sparrow were so far away so as to not be worth photographing, but I did get record shots of the other two. As for photography, I spent a wonderful morning at Elephant Head Pond in Amado adjacent to the the Santa Ritas Mountains (Madera Canyon). For those not familiar with this spot, it is desert photography at its finest. Seed and suet are put out every day, and many species (Gambel's Quail, White-winged Dove, Curve-billed Thrasher, Hooded Oriole, Northern Cardinal, Gilded Flicker, Lucy's Warbler, Pyrrhuloxia, etc) cycle through the property to graze on the handouts each day. There are several blinds, and photographers are free to configure a wide array of perches however they like. The place has recently changed ownership and is now run by world-renowned wildlife photographer Dano Grayson. Dano is a really great guy and has some of the most amazing photography stories I've ever heard, so be sure to engage him if you make it to his place. If you're interested in shooting at the Pond at Elephant Head, you can get in touch with Dano at dano@danograyson.com. Tell him I sent you! I should also mention that Dano has a second set of blinds higher up in Madera Canyon that gets a completely different set of birds (Hepatic Tanager, Black-headed Grosbeak, Acorn Woodpecker, Mexican Jay, etc) than the pond. It's totally possible to spend one day down low and another up high. With that I'll throw up a few of the shots I collected during my single morning at the pond. 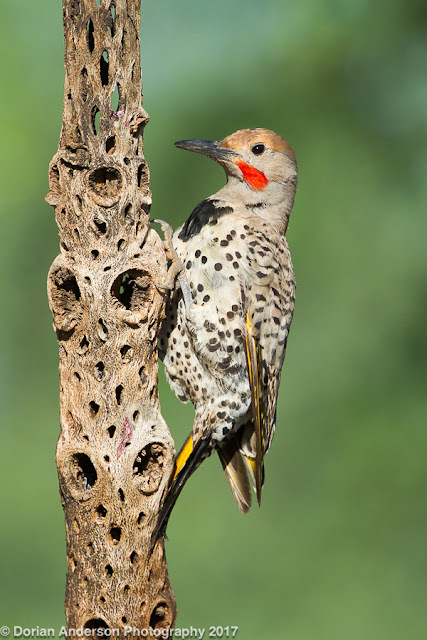 The flicker is the bird I most wanted this year. He was lured - only briefly - to this perch by a bit of suet packed into the back of the cholla skeleton. The idea in all of these shots is to get the bird to land on perch that has been positioned to be both fully lit and sufficiently far from the backing foliage that the background is rendered smooth and creamy. For best results, the perch should be at least twice as far from anything in the background than it is from the photographer. Do notice that the above two shots both utilize the same perch, albeit at different proportions in the final image. That's always a dead give-a-way for set-up shots. The idea is to make set-ups shots look as natural as possible, and that's really hard to do if the same perch is used repeatedly. Varying perches will alway give the most interesting results. It's also a lot of fun to try to get exactly the bird you want on exactly the perch you want (see also these examples from last year). 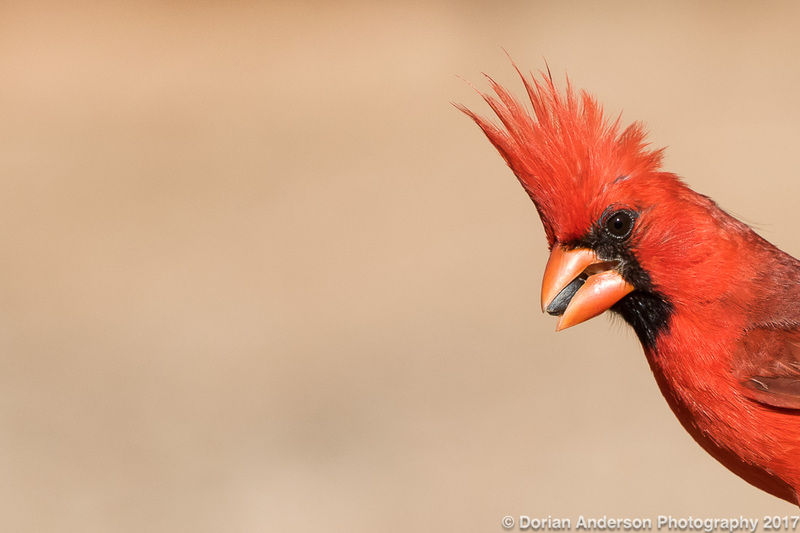 These 2 cardinal shots were actually my favorites of those that I collected this year. Believe it or not, they were my first nice shots of this species. They were very common where I lived in Boston (2011-2013), but I was always focused on photographing shorebirds or generally rarer species. I kept assuming that I'd catch up with cardinal at some point but never did - until now! I'll leave you with one technical tip. 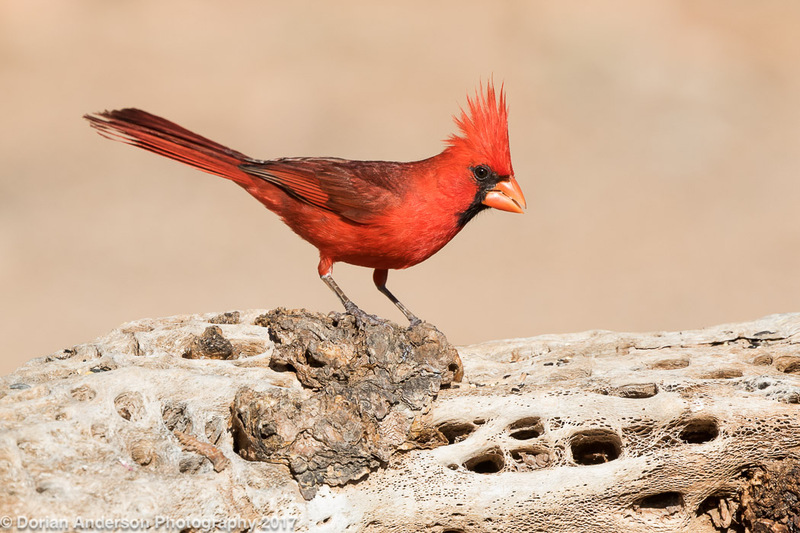 It is really important when shooting in bright desert sun to be mindful that you don't blow away the whites or completely saturate the colors of bright birds like the cardinal. If you overexpose, you'll lose all that lovely feather detail and be left with birds that look like nondescript blobs. So, that's it for this installment. I'm sure migration and my upcoming pelagic trips will yield some interesting content in the next few weeks. Beyond that, I head to Taiwan in October and Ecuador in December, so please stayed tuned for recaps of those trips as the year winds down. Cheers!